Everyone knows that how important is to take care of one’s skin, face, and body. Most of us take care of our hands but every time forget to take care of the nails. When it comes to nail care, manicure is not enough. In fact, one should always take care of their nails on a daily basis. 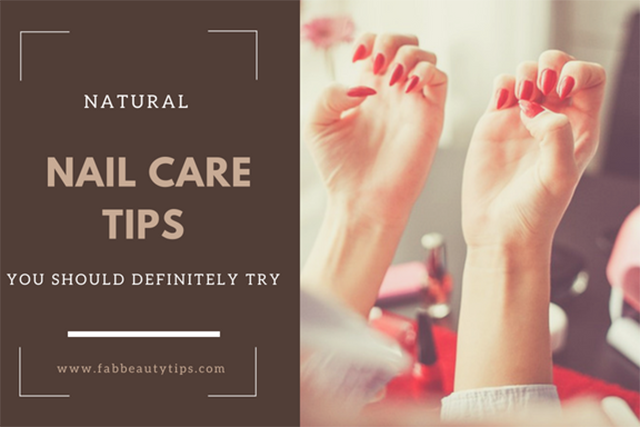 So here are some natural nail care tips and tricks which you can follow and make your nail care easy. All the problems in the human body always started because of germs and bacteria. These make the human body sick and weak. You have to make sure that they cannot breed more and for that, you should always keep your hands and fingers clean and make sure to dry them. Biting the nails can cause you a lot more then you think. It damages the nails and when nail comes in contact with the saliva of your mouth, nails get more weak and brittle and also damage the cuticle. Also, putting fingers in your mouth can cause you stomach infections and severe problems. Cuticles are very delicate and crucial part of nail care to handle. If you having hanging skin or nail then handle it very carefully. Tame your cuticle with proper care and be gentle on them. Also never forgot to moisturize them with a good moisturizer or any other cuticle oil. Maintaining the hygiene is a must for everyone, especially for a good nail care. Clean your nails regularly and properly. Make sure your all nail tools are periodically washed and proper sanitized. Also don’t grow your nails extra long as they attract more dirt and germs. You can also apply natural disinfectants like tea tree oil. As dry and flaky skin is not good for the face, same applies for nails also. Nails are very delicate and can be broke easily. To moisturize them and to make them strong, you can opt for a cream or a cuticle oil or you can also go for some oil which meant for making nails strong. Trimming your nails on regular periods are as important as trimming your hair on regular periods. Nails are same as hairs. Hair have split ends which have to be cut down and nails can be broke from one side or they need to have a clear shape. So take some time after few weeks and trim your nails neatly. Base coat forms a protective layer on the nails and prevent the problem of discoloration and getting stained. It will also make your nail polish looks good and enhance the colour of it. So next time make sure you never forgot to apply the base coat. Using proper Nail polish bottle is also necessary. A top coat helps you to make your nail color last longer. It also adds shine to the nails and prevents them from chipping off. If you want a matte finish then you can also choose the top coat in the matte one. There are so many ranges are available in the market to choose from, so check it out. Scratching your nail paint when you are run out of the nail paint remover is a bad idea. It make your nail surface rough and patchy. It also harm the health of the nails and remove the upper layer of it. Gels and acrylics look so much pretty but at the same time it damage our nails to an extent. Acrylic powder contains so many chemicals which will damage the nails in so many ways. The drying mechanism in the gel manicure cause harm to the skin around the nail. Avoid them as much as possible. Ever notice after filing your nails they get more harder and break easily? This is because so many of you shape your nails in two direction and it will make them weak. Always shape your nails only in one direction and save them from getting weak. Avoid water based manicure because the nail polish will chip away faster. The nail bed absorbs the water and expands when dipped in the water. Instead go for the oil based manicure. Where you clean your nails and nail bed with the oil. When ever you want to buy a new nail polish be careful. Paraben and sulfate free nail polish are best for your nails. Also avoid eating with hands full with nail polish as when you eat the food and bite it, the nail paint will get chip and fall in your meal. So take care of your food too. When ever you have a manicure or just cleanse your nails don’t go for the nail paint first. Instead of this buff your nails. This will add a natural shine to your nails and remove the excess dirt and dead skin from your nails. Doing oil massage for the nails are as important as doing this for this hair and body. It could be better if you opt for hot oil massage on your nails. This will make them stronger and shinier and also helps in growing longer. You can choose almond oil or olive oil or mustard oil for massaging. Using cheap price remover and of bad quality can do more harm than anything else. The cheap quality nail polish remover has so many chemicals which might give your nails the problem of discoloration and it also make them weak. So always go for a good nail polish remover which have less chemicals in it. Always choose an acetone – free nail polish remover. Acetone is very harsh for the nails and around the skin area of the nails. It do more damage by making them dry which cause the nails to break easily. We all face this while applying nail polish, that we end up applying the nail polish on the cuticle too. But you have to clean for a pretty manicure look. Use a cotton bud dipped in the remover and remove the extra nail polish from your cuticles. By this we mean cut your nails evenly and smoothly for a better look. Also don’t grow your nails too long that they face more damage. Choose your nail cutter wisely as they also make so much effort in shaping your nails with a touch of perfection. It’s not good to apply nail polish every time you get a manicure or clean them. This is one of the important point on nail care tips that we should give them time to breathe. For a while don’t apply a nail polish on them and set them free. Just do the basic cleaning and oiling and that’s enough. Apply the nail polish when it’s really required otherwise leave it. Apart from these things the main reason for the weak nails is diet. Take a diet rich in vitamins and minerals. It will make them strong and more healthy. Also eat omega 3 rich foods to strengthen them. Can you get nail fungus from gel nails? Ans: Yes! Sometimes you may get nail infections and fungus from the gel nails, as they make the nail weaker and results in nail bed infections and such type. Do acrylic nails ruin your own nails? Ans: Yes! Acrylic nails too make your nails weaker and damage them. Frequently touch ups can seriously damage your natural nails. In short artificial nails can make your own nails weaker, brittle and parched. Now there are many good brands which do not harm your nails at that extend. Can you get cancer from fake nails? Ans: Well, first chemicals used in acrylic nails are so unhealthy and dangerous for the nails. They may contain some chemicals which can be a cause for cancer. The bond of the acrylic nail and natural nail is much stronger. You should always visit a professional nail artist for getting your nails done. Because nowadays professionals work with a good quality product and they provide you the hygienic environment with sterilized equipment. 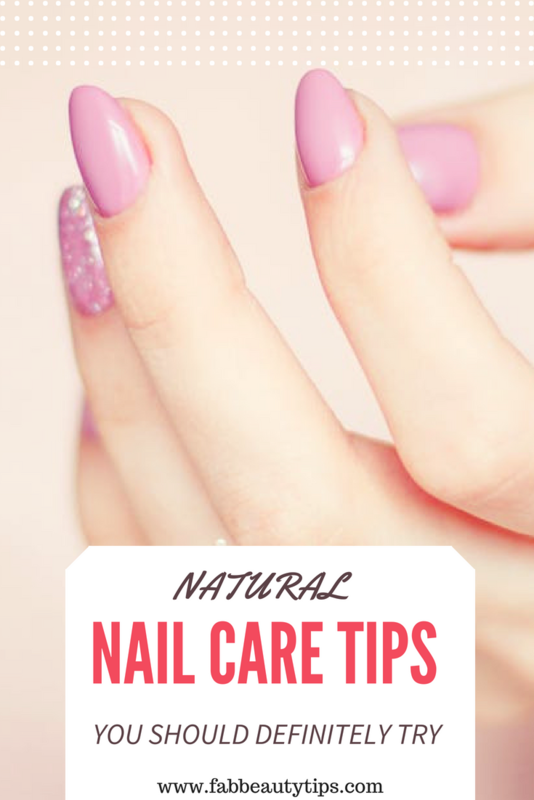 So, these are some natural nail care tips and tricks which you can follow on a daily basis and make a change in the health of your nails.